Local NGOs in the Somali capital, Mogadishu, have set up a task force in a bid to mobilise urgent help for thousands of displaced civilians. "The situation is so bad that if nothing is done many will die," Asha Sha'ur, a civil society activist, told IRIN on 25 May. "We are appealing to the international aid agencies to help these desperate people before it is too late." 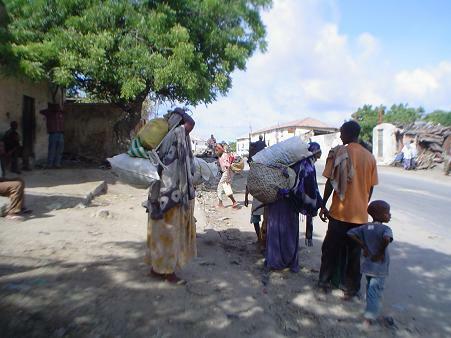 Aid work in Mogadishu has virtually ground to a halt because of increasing violence. An estimated 57,000-60,000 people have fled their homes since the latest fighting flared on 8 May, according to the UN Refugee Agency, UNHCR. Yassin said the death toll included seven policemen killed by a suicide bomber on 24 May. The violence has forced Médecins Sans Frontières to close its outpatient clinic in Yaaqshid district. The health facility would re-open once there was minimum security, it said. "Even local NGOs are afraid to respond because of the uncertain security situation," a local humanitarian worker said. Last week, the UN Children's Agency (UNICEF) reported the looting of its compound in Jowhar, 90km south of Mogadishu, when Al-Shabab militia captured the town. More than 50,000 severely malnourished children and at least 85,000 moderately malnourished children in south-central Somalia have been affected by the interruption in nutritional and medical supplies. The 17 May looting resulted in the destruction of humanitarian supplies, assets and equipment. "The cold chain [vaccine storage] equipment was affected, destroying thousands of doses of measles, polio and other vaccines meant for Somali children," UNICEF said. Sha'ur and other civil society leaders urged the international community and Somalis in the diaspora to help the thousands of desperate people displaced by the violence that has pitted government forces against insurgents. "The reason we set up this task force is to make sure that we accompany [aid agencies] wherever they want to go," Sha'ur said. "We were at some of these camps [on the outskirts of the city] and found the conditions heart-wrenching." The newly displaced were living in dire conditions. "Many of them have no shelter and so are sharing small spaces with others and have very little food, if any," Sha'ur said. "They need help in all areas but shelter is most urgent." Nasteho Osman, a 29-year-old single mother of four, returned last week to the camps for the displaced which she left only a month ago. "I was in Bakara market when the fighting began [on 8 May]; I had to rush back to my house to make sure my children were safe," Osman said. "I got out six days ago with only what we could carry." The situation deteriorates whenever it rains. "We only have one small shack that we use for shelter and when it rains, no one can sleep," Osman added.